The greatest thing about the Canyon Worship Songwriters Showcase on Monday night was that it had so many great things. The first performance of the Canyon Worship Songwriters Showcase, by Braden Paul, had the big crowd standing and clapping as Paul really got into it. There was the music, of course. 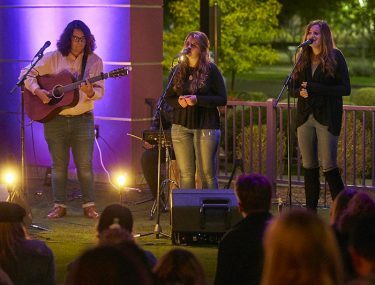 Students from the Center for Worship Arts at Grand Canyon University continue to build upon the talent that now is a staple of the Canyon Worship albums. But there also was the Canyon 49 Grill venue, again a winner for its intimacy and atmosphere. And the huge turnout that packed just about every inch of the Grill’s patio. And the number of graduates of the program who came back to hear their former classmates one more time and discover some new talent. And the number of current Worship Arts students who came out to show their support even though their songs weren’t chosen for the Showcase. The attendees were packed in, and the performers had their full attention. And it was hard for anyone familiar with Canyon Worship not to notice that only three of the 13 songs were by performers who have appeared on the annual albums. And you also couldn’t miss the ever expanding variety of sounds – the 13 songs performed (out of 70 submissions) featured a wide variety of genres, from contemporary Christian to folk, hip-hop and rap. Maybe the greatest part of all, however, was the way the big crowd got into it. There never was a dull moment on a night filled with clapping and rejoicing and ovation after ovation. As impressed as Downs was in his first chance to witness a Showcase, it was even more astounding for Dr. Jason Hiles, Dean of the College of Theology. He remembers well the first Showcase, in December 2014, the first year of the program. Newcomers to the program are coming a long way just to be part of it. 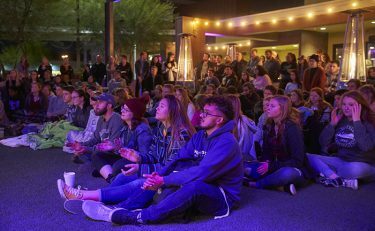 One of the performers Monday was freshman Amanda Riffe from Grand Rapids, Mich., who first heard about what GCU was doing when she attended a Kari Jobe concert. She visited the campus, fell in love with it and happily left behind her winter coat and scarf, but the climate was only an added bonus. “The weather is so nice here, so much sunshine, but mostly I’m here because of the program,” she said. 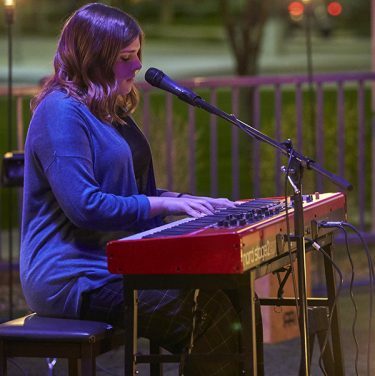 This is a performer who’s already pretty accomplished – she produced her own CD, “The Journey,” earlier this year – but what she likes best about the program is the camaraderie. 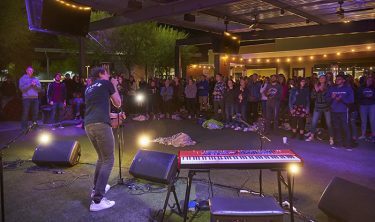 Elaina Marchegger was visiting GCU as a high school senior two years ago when she learned that there just happened to be a Songwriters Showcase that night. So she went – and right away she knew what her college choice would be. Marchegger was the only performer chosen to do two songs, but even that wasn’t the highlight of her night. Her parents, Marcus and Lisa Marchegger, surprised her by coming to Phoenix from their Carson City, Nev., home to support her. She also noticed the number of students in attendance who aren’t even in the Worship Arts program, but equally head-turning was the turnout of graduates. The long list of new faces was startling as well. 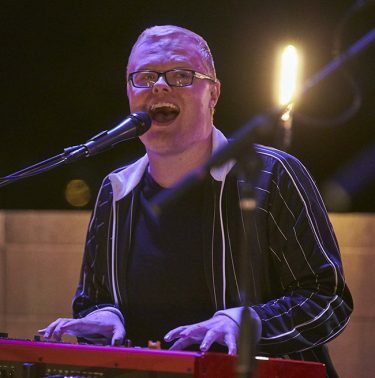 Even Harrison Russell, whose song “Rhythm” is the top attraction of Canyon Worship 2018 (more than 30,000 listens on Spotify alone), said he found himself trying to put names with faces at the Showcase. Harrison Russell’s performance of “Praises” was an appropriate ending for the evening. “It’s crazy. I feel like every song I’m asking, ‘Who’s that?’” he said, laughing. Appropriately, Russell’s newest creation, “Praises,” was the closing song, and it was another show-stopper. But the crowd wanted more – people chanted for Russell to play “Rhythm.” Right on cue, Johnson had the sound board technician dial it up and play it … and the crowd sang along and danced to it, knowing the words by heart. That shows how much the program has grown – the attendees have their favorites. But if Monday night is any indication, they soon will add some new ones. “I feel like every year it’s just growing so much,” Russell said. “Now we have a full-grown program, and there are such talented people every year in every class. There’s only one bad thing about all this growth: If this keeps up, they’re going to need a bigger venue for the Showcase. If that’s your biggest problem, you’re doing great things.